Dean’s office of the Faculty of Automobile Transport consists of 4 departments: Operation of Transport and Sustainable Technologies (OTST), Transport logistics and service technology (TLST), Descriptive geometry and graphic design (DGGD), Physical Education (PF). 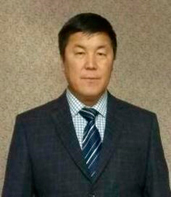 Deputy dean for educational work – Alibayev Kanatbek Kalykovich, graduated from Osh Technological University with a degree in “Auto Service”, Master, the number of scientific and methodical works – 6 (mobile 0773833831, alibaevkanatbek79@gmail.com). The Faculty of Automotive Transport is one of the oldest faculties of the university. The history of the faculty is inextricably linked with the well-known names of employees who worked at the university in different years. In 1963, the Osh evening faculty of the FPI was opened and three summer training of students on the specialty “Automobiles and Automobile Economy” was organized. In 1976, the Department of Automotive Transport was established, where the training of “mechanical engineers” with higher education was conducted. In 1979, the first graduating of engineers – mechanics in the specialty “Automobiles and Automobile Economy” was held in the Osh evening faculty of the FPI. In 1988, the Department of “Automobile Transport” opened a new specialty “Organization of Transportation and Management in Transport” for full-time, evening and correspondence courses. In 1993, the first graduates of full-time engineers took the above-mentioned specialty. In 1996, students of construction specialties were withdrawn to a separate engineering and construction faculty, so the Faculty of Engineering was renamed the Faculty of Energy and Transport. Every year the faculty “Automobile transport” develops its specialties, for example, such as “Auto Service”, “Organization and traffic safety”, “Customs business”. In 2000, the first graduating of engineers was held in the specialty “Organization and traffic safety”. At the faculty the above-mentioned specialties are prepared by highly qualified specialists. 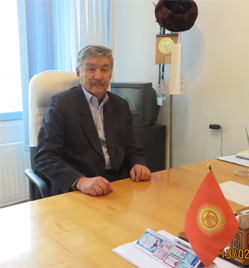 Since 2003, Dean of the Faculty is Candidate of Technical Sciences, Corresponding Member of the Engineering Academy of the Kyrgyz Republic, Professor Oshtu Zhorobekov BA. In 2004, the Faculty of Transport and Technology Service received a new name of the Faculty of Automotive Transport. Forms and duration of training: full-time (full-time) – 4 years, distance-5 years. Qualification of the graduate: bachelor. Forms and duration of training: full-time (remote) – 2 years. Qualification of the graduate: master. The faculty has a sufficient number of classrooms, specially equipped laboratories and classrooms for conducting classes. The laboratories of the faculty have posters, operating mock-ups, traffic lights, a test tester, parts, sections of units, operating models of vehicle units and assemblies, sets of instruments, posters and necessary equipment. An autotrainer was installed to teach driving a car, there is a computer class with 10 INTEL DUOL CORE LCD computers for execution of course, laboratory works, development of work programs, design of the department’s documentation. International cooperation is one of the priority activities of any educational institution. The aim of the faculty is to intensify scientific cooperation with foreign colleagues, to strengthen business relations of the department with foreign and international companies and organizations. Expansion of the spectrum and volume of educational services, activation of student and teacher exchange processes. For this purpose, the faculty conducted active research work on international projects 530793-TEMPUS-1-2012-1-SE-TEMPUS-JPCR, Сredo Tempus and Mapree Tempus. Within the framework of the 530793-TEMPUS-1-2012-1-SE-TEMPUS-JPCR program, a number of undergraduates have been produced from the 2015-2016 academic year (License for the right to conduct educational activities in the field of vocational education of the Ministry of Education and Science of the Kyrgyz Republic Annex No. 2 to license No. LD150000718, registration number 15/0376. (The license expires in 2017.) In the period of 2015-2017 academic years, 7 masters were graduated in the international project TEMPUS MAPREE No. 530793 in the direction “Construction” profile – Renewable energy sources and energy efficiency in buildings. 15 magicians are trained countries. To the organizational and educational work at the department, “OTST” is also paid much attention, considering it as an important component of the entire educational process. In OshTU created a system of moral and material incentives. Every year the Rector’s New Year’s ball of honors is held, where students are rewarded with prizes, cash prizes, diplomas for achievements in study and outside of academic activities. Winners of subject Olympiads, competitions of diploma projects, participants of amateur performances, athletes who have won prizes are systematically awarded and encouraged financially. Creation of a system for optimizing the route and environmental safety of automatic telephone exchanges in Osh city using GIS technologies. Development of mathematical dependences of the effect of air humidity on the performance of vehicles in high mountain conditions on the Osh-Sary-Tash route. The results of scientific research of the faculty are reflected in publications, speeches at conferences, and the publication of scientific works. Teachers and students actively participate in the work of various scientific, scientific and practical conferences, symposiums, congresses, seminars, round tables. When performing research, students study the equipment for the educational process, make reviews of the literature “reports” and abstracts on patent searches, carry out research work, as well as course and diploma research. According to the results of the scientific work, students make reports at the annual academic and practical student conference of the OshTU. Participates in olympiads, exhibitions and competitions of student works of various levels. Every year the best work of students is published: in “Izvestia” OshTU. Over the period of the department’s existence, the staff wrote more than 100 scientific articles. Teachers of the faculty take an active part in international projects, scientific, organizational and educational life of the university. The department “Exploitation of transport and sustainable technology” is one of the oldest departments of the university. The history of the department is inextricably linked with the well-known names of employees who worked at the university in different years. The first set was made in 1963, when the Osh evening faculty of the Frunze Polytechnic Institute opened, in which from 1 to 3 courses were conducted general technical training of students in the specialty “Automobiles and Automobile Economy”. Since 1976, the students were trained in the full program of training mechanical engineers, in the same year the department “Automobile transport” was established, the head teacher was appointed senior lecturer Arakeev A.A. In 1979, the first graduating of mechanical engineers in the specialty “Automobiles and Automobile Economy”was held at the PCF FPI. In 1985, the Osh evening faculty of the Frunze Polytechnic Institute moved to a newly built educational and laboratory building in the Southeast of the city. The department “AT” having specially adapted premises in the new building has again created laboratories on special disciplines (TEA, device of cars, car repairs and traffic safety). In 1993, the first graduates of engineers in the specialty of daytime training were held, and in 1994, evening and correspondence courses. In 1994 the department expanded the nomenclature of specialties, the specialties “Organization of road traffic” and “Autoservice” were opened. In 2000, the first issue of the specialty “Organisation of Traffic”was implemented. In December, 2003 the department “Automobile transport” was renamed into the department “Organization of traffic”. In October 2012, the department “OT” was renamed the department “ Exploitation of transport and sustainable technology”, the department “ETST”. The department has a sufficient number of classrooms, specially equipped laboratories and classrooms for classes. In the laboratories of the department there are posters, operating mock-ups, traffic lights, a test tester, parts, sections of units, operating models of vehicle units and assemblies, sets of instruments, posters and necessary equipment. An autotrainer was installed to teach driving a car, there is a computer class with 10 INTEL DUOL CORE LCD computers for execution of course, laboratory works, development of work programs, design of the department’s documentation. International cooperation is one of the priority activities of any educational institution. The goal of the department is to intensify scientific cooperation with foreign colleagues, to strengthen the business relations of the department with foreign and international companies and organizations. Expansion of the spectrum and volume of educational services, activation of student and teacher exchange processes. To this end, the department “ETST” conducted an active research work on international projects 530793-TEMPUS-1-2012-1-SE-TEMPUS-JPCR, Сredo Tempus and Mapree Tempus. Within the framework of the program 530793-TEMPUS-1-2012-1-SE-TEMPUS-JPCR from 2015-2016 academic year, a set of undergraduates was made (License for the right to conduct educational activities in the field of vocational education of the Ministry of Education and Science of the Kyrgyz Republic Annex No. 2 to license No. LD150000718, registration number License validity period 2017). In 2015-2017 academic years, 7 Masters were graduated under the international project TEMPUS MAPREE № 530793 direction “Construction” profile – Renewable energy sources and energy efficiency in buildings. At the moment, 15 master students study at the second year. Over the five-year period of the department’s activity, more than five thousand graduates successfully trained in all regions of Kyrgyzstan and abroad have been trained in various sectors of the national economy: GAI, Ministry of Internal Affairs, Ministry of Emergency Situations, Transport Department, Kyrgyz Transport Inspectorate, South- and green economy of Osh city, “Zhyldyz tour” LLC, “Davut” auto service, “Zhanyzhol” LLC, “Avtochkombinat, Osh city municipal motor transport enterprise, Osh city bus station. To the organizational and educational work at the department“ETST” is also paid much attention, considering it as an important component of the entire educational process. In order to activate and improve educational work at the department, the curators are monitored monthly. Listening reports of curatorial activity. Directly under the supervision of the head of the department is drawn up the curator’s work plan. In recent years, many different events have been held, dedicated to state holidays, major historical events, memorable dates in Osh and Kyrgyzstan. In order to form and develop the traditions of an educational institution, celebrations, open days, honoring veterans, meetings with graduates of OshTU University are practiced. Subbotniksare held regularly on the part of the city authorities and the University for the purpose of labor education of student youth. Each faculty has a section of the territory where students are systematically working. In OshTU created a system of moral and material encouragement. Every year the Rector’s New Year’s ball of honors is held, where students are rewarded with prizes, cash prizes, diplomas for achievements in study and outside of academic activities. Winners of subject Olympiads, competitions of diploma projects, participants of amateur performances, athletes who have won prizes are systematically awarded and encouraged financially. More educational was the educational work carried out in dormitories. It has become a tradition to hold parties dedicated to festive and significant events. The results of the department’s scientific research are reflected in publications, speeches at conferences, and the publication of scientific works. Teachers and students actively participate in the work of various scientific, scientific and practical conferences, symposiums, congresses, seminars, round tables. participate at lympiads, exhibitions and competitions of student works of various levels. Every year the best work of students is published in “Izvestia” of OshTU. Over the period of the department’s existence, the staff wrote more than 100 scientific articles. Teachers of the department take an active part in international projects, scientific, organizational and educational life of the university. The head of the department “Exploitaition of transport and sustainable technology”, is the senior Zhakypjanova V.S. Specialty: Engineer of Organization of transportation and control of transport, graduated the Osh High Technological College in 1993, Master of Construction in the specialty Renewable Energy Sources and Energy Efficiency in the buildings of OshTU in 2017. Total number of publications: 38 scientific publications, including 30 methodical instructions, 8 articles and 1 patent. Seminar-training on “Training of experts for licensing and accreditation of educational activities” – December 15, 2017. Osh TU. Scientific degree: Doctor of Technical Sciences. Academic title: Professor, Academician of the International Engineering Academy. Scientific works: He has more than 60 published scientific articles, including 3 author’s certificates, 21 methodical instructions, 2 textbooks. Master of Construction in the specialty Renewable Energy Sources and Energy Efficiency in the buildings of OshTU in 2017. Physical culture in a higher educational chair is an integral part of the formation of the general and professional culture of a modern specialist. As a training discipline is mandatory for all specialties, it provides a profiled physical readiness, is one of the means of forming a comprehensively developed personality, a factor of strengthening health, increasing efficiency, contributing to better utilization of the body’s human forces in different living conditions. The process of physical training involves the solution of educational, educational, scientific, developmental and recreational tasks. The Department of Physical Education is the main structural educational and scientific subdivision of OshTU, which carries out educational, scientific and educational, methodical, mass health, physical and sports work. The department was established in March 1991. Currently, the faculty “FV” employs 9 teachers, 1 specialist, 1 laboratory assistant. Of these, 3 associate professors, 2 senior lecturers, 1 “Excellent worker of national education of the KR”, 4 “Excellent worker in physical culture and sports of the KR”, 1 teacher are masters of sports of the USSR and 1 teacher – master of sports of the KR. Under the guidance of the teachers of the department there are sports sections in the university in the following sports: football, basketball, volleyball, track and field, table tennis, chess, Greco-Roman wrestling, freestyle wrestling, national wrestling, Toguz korgoyol. Sports club “Namys” of the University was formed according to the calendar plan spartakiads, competitions of students between faculties. Traditionally, the Autumn Cross “Golden Autumn” is held among teachers and students, the first-year sports contests between the faculties. And also sports contests are held among teachers and university staff. Teachers of the department constantly participate in competitions, sports days, competitons among universities in Osh. Students – university athletes participate in competitions of city, regional, republican, international level. In terms of sports the national team of OshTU participate in city competitions, regional and national scales. They made many successes and achievements. In 2004, the Department of Physical Education received the nomination “The best department of OshTU”. 2009 received the nomination “For the best achievements in sport”, in 2001 the diploma “For the best achievements in sport”. Every year, the staff and staff of the OshTU participate in the Spartakiad of Educational Workers of the Kyrgyz Republic “Den sooluk”, organized by the Republican Center “Zhashtyk”, held in the Issyk-Kul region in the city of Cholpon-Ata, where they repeatedly received prizes. Spartakiad freshmen among the faculties. The MM Cup. Adysheva is among college students. Open championship on billiards among the teaching staff. Chess championship among the teaching staff and students. Friendly meeting among universities on sports. Open championship among clubs on volleyball. In the world championship on Karate the student of group IKT-2-12 Rezhep kyzy Perizat took 1st place. Mass race in track and field athletics, dedicated to the 20th anniversary of the Emblem of the Kyrgyz Republic, TII student -14 Sulaiman kyzy K took 2nd place. In October 2015, Gaipov E. took part in the Asian Table Tennis Games in Thailand. In the international tournament in Turkey in freestyle wrestling, the student of the TOIRAT-13 group Orunov Ryspek took 3rd place. In II World Games of nomads in the city of Cholpon-Ata, the student of the group DAS-1-12 Miyazamidin M. took 3rd place in freestyle wrestling. Master of Sports of the Kyrgyz Republic in boxing Arziev Orozbek of group PGS-1-13 took part in international tournaments, where he won 2nd place in Uzbekistan, 3 place in Tajikistan, 2 place in Kazakhstan. According to the sports magazine “Topsport.kg”, the “Best Sportsman of the Year” for volleyball of the Kyrgyz Republic in 2016 is recognized. The plan for the research work of the department is drawn up and approved. Mamyrkulova M. “Sports technology” (article). Suranchiev Anarbek Bokoevich – head of the chair FE, docent, “Excellent worker in physical culture and sports of the Kyrgyz Republic”. He received a certificate of professional development in volley-ball. Teacher of physical education. Kuluev Bakyt Mamasaitovich – docent, “Excellent worker in physical culture and sports of the KR”. He received a certificate of professional development in volleyball. Judge of the national category on volley-ball of the KR. Responsible secretary of the federation on volleyball of Osh city and Osh region. Teacher of physical education. 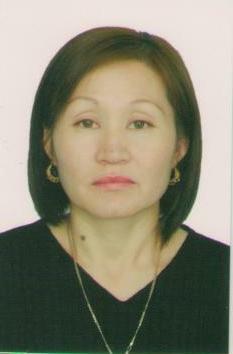 Uraimova Khalida Shaikhdinovna – senior teacher, “Excellent worker in physical culture and sports of the Kyrgyz Republic”. Has received the certificate of improvement of professional skill on volley-ball. Senior teacher on physical training. Kenzhebaev M. – docent of the department, “Excellent worker in physical culture and sports of the KR”, “Excellent worker of public education of the KR”, “Veteran of sports of the KR”. Teacher of physical education. Karimov Akyl Kozuyevich is a senior teacher. “Excellent worker in physical culture and sports of the KR”. He received a certificate of professional development in volley-ball. Teacher of physical education. Mamyrkulova Meerim Erkinbekovna – teacher. Received a certificate of professional development in volley-ball. Teacher of physical education. Atabaev Almaz is a teacher. “Master of Sports in Volleyball of the KR”, Vice President of the Federation of Volle-yball of the KR of Osh and Osh region. Teacher of physical education. 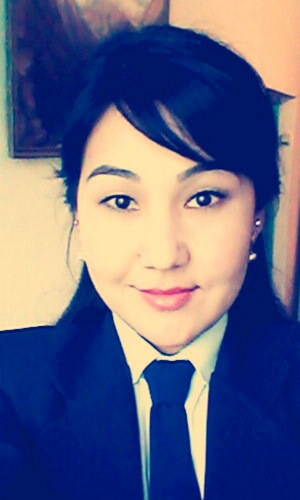 Paiazbek uulu Rustam is a teacher. Zhigitaly uulu Talant – laboratory assistant of the department. Formation of the department “Descriptive geometry and graphic design” begins with the first days of the university. Since 1963, for engineering specialties, such fundamental disciplines as “Descriptive Geometry”, “Engineering Graphics and Drafting” have been introduced. In 1991, on the basis of the above-mentioned disciplines, a sector of “Engineering Graphics” was formed within the Department of Mechanics of Machines and Engineering Graphics. The sector was headed by docent Zhusupov Alibay Aldyrakhmanovich. In 1994 the sector “Engineering Graphics” became an independent department. The chair was headed by the candidate of physics of mathematics, associate professor Opalender Boris Vladimirovich. Teachers Satmamatov Aichi Satmamatovich, Eshimbekov Tokon Eshimbekovich, ErkulovaRaya Torubayevna, candidate of pedagogical sciences KasymbaevBakytbek, BakirovIsmanaly worked at the department. They made their personal work for the benefit of the prosperity of the department. In 1994, the department joined the department of “Labor Training and Engineering Graphics”, headed by docent Zhusupov Alibay Aldyrakhmanovich. 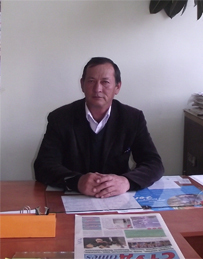 From 2005-2014, the department was headed by docent Zhusupov Alibay Aldyrakhmanovich. The department was considered as a servingchair of the department and were taught above mentioned disciplines to the students. 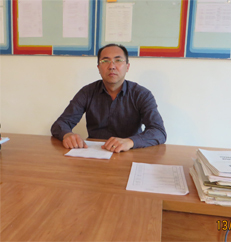 Since 2014 to the present time the chair is headed by the candidate of pedagogical sciences, docent Toktosunov Almazbek Askerovich. At the moment, four docents of OshTU, two members of artists of the USSR and the Kyrgyz Republic, one candidate of sciences, one teacher, one engineer-programmer, and one laboratory assistant work at the department. On the activity of the department. Department “Descriptive geometry and graphic design” for the preparation of future specialists in the field of 570400-Design, graphic design is staffed with scientific and pedagogical staff, having a basic education, corresponding to the profile. Graphic design, the department has one computer room. It is equipped with 20 computers with Internet access, reference and legal databases and electronic library funds. In offices “Descriptive geometry and engineering graphics”, “Drawing”, “Painting and composition” and in other offices are provided with free access to the Internet using Wi-Fi technology, office equipment: scanners, printers. Training audiences are equipped with modern audio and video equipment, in classrooms, for lecture classes, equipped with projectors and other equipment for presentations of educational material. And also modern licensed computer programs are downloaded in computers. Teachers of the department regularly engaged in the upbringing and training of students, helps them in the implementation of any graphic, design projects, as well as research. Improving the graphic skill of students at the university. Investigation of the projection of solar rays. ( instructions to implement the graphics setting for students) Printed at OshTU 2004, Descriptive Geometry and Engineering Graphics Printed atOshTU 1998 Well, The basis of drawing Geometry (for individual work) 2007, Integral system values ​​in the preparation of future engineers-educators in the university, VestnikOshGU 4th international conference. Osh-2004. professional retraining: Information technology in education. publications (creative work): “Azhar”, “Pillow”, “Stones”, “On the night of the moon eclipse,” “Cradle”. The work of the author is kept in the state museum. Participation in exhibitions: 1979. Youth insertion of the city of Frunze “Son of a gardener”, 1984. Republican exhibition “50 years of Kyrgyzstan”, “Portrait of Mother”, 1987 All-Union Exhibition in Moscow “Sunny Day”, 1990 Regional exhibition of Alma-Ata poster “Death in nature” etc. Academic title: Excellent Teacher of culture of the KR. The main publications (creative works): Zhylkychynyn Boz Uyundo, Bakan, Tandyr, Zhomok, Zhymzhyrtyk, Topoz Mingen Bala, Post Syndrome, etc. The Osh evening faculty was opened in 1963 in Osh at the Frunze Polytechnic Institute, where from 1 to 3 courses were conducted general technical training ofstudents in the specialty “Automobiles and Automobile Economy” (AAE). Since 1976, the students were trained in the full program of training mechanical engineers, and in the same year the Department of Automotive Transport was established. The head of the department was appointed senior teacher AA. Arakeev. In 1979, the first graduating of mechanical engineers in the specialty “Automobiles and Automobile Economy” was held at the Osh Evening Faculty of Bishkek Politechnic Institute. From 1981 to 1984 Department “Motor Transport” was headed by docent G. Satybaldiev. In 1984, the head of the department was appointed Candidate of technical sciences, docent E.T. Orozbekov. In 1985, the OEF BPI moved to a newly built training and laboratory building in the Southeast area. The department “Automobile transport” received specially adapted premises in the new building. From 1986 to 1991 The department “Automobile transport” was headed by Candidate of technical sciences, docent A.V. Kapustin. In 1988, the department “Automobile transport” opened a new specialty “Organization of transportation and management of transport” day, evening and correspondence forms of training, and in the same year the department “Automotive transport” was renamed the department “Organization of transportation and control of transport”. In 1991, the head of the department was elected candidate of technical sciences, docent E.T. Orozbekov. In 1992, the first graduating of engineers in the specialty “OTMT” day training was held and in 1994 the evening and correspondence courses. “Management on AT”. In 1997, the department “OTMT” was renamed the department “Automotive transport”. The department for three years (1997, 1998. 1999) at the end of the year was recognized as the “Best Chair of the OshTU”. Since March 2000, the department “AT” was headed bycandidate of technical sciences., Atabekov K, the department “Automobile transport” was divided into the department “Automobiles and service technology” and the department “Organization of traffic and transportation”. Since 2005 the department “ATS” has been renamed into the department “Technical maintenance and repair of cars”. Since 2004-2017. the department was headed bycandidate of technical sciences Abdurakhmanov S.K. In 2017, the departments “TERA” and “Organization of Transportation” were merged into one and renamed “Transport logistics and service technology”. 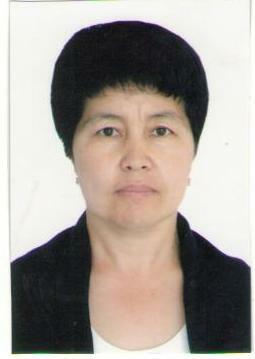 Currently, the head of the department is docent OshTU Kariev B.C. Profile: “Cars and Automobile Economy” (A and AH). The department “Transport logistics and service technology” (TLST) is the issuing department, which prepares bachelors of a wide profile for motor transport. The main field of activity of these bachelors is the technical service of motor transport and service enterprises of all forms of ownership. At the present time (2018) 4 teachers work at the department, including 2 candidate of technical sciences, docents, 1 docents of Oshtu, 1 senior teacher and 2 assistants. Educational standards for these specialties and areas are developed with the active participation of teachers of the department. The bachelors graduated from the department enjoy a steady demand, they are highly professional specialists of a wide range, able to work effectively in engineering, management and management positions in motor transport enterprises, maintenance stations, service and repair workshops, small and medium businesses, supply systems, and also in industry. The department carries out constant work on improving the educational process, curricula and programs, the basis for which are the results of scientific research conducted by the department in various areas: reliability and diagnostics of cars, maintenance materials, car service, operation and design of garage equipment, etc. The department conducts an active work in the part of organizing scientific research of students. NIRS is carried out within the framework of the organization of the educational process in the control of the independent work of students, as well as within the framework of scientific student circles operating at the department and organized by the University and other institutions of competitions for scientific student works. The scientific activity of the department includes the following areas: participation in scientific research and scientific and methodological activities, publication of scientific articles in leading scientific journals and other publications. Teachers participate in grants that are a source of funding for scientific, scientific, pedagogical and innovative activities, in scientific conferences of various levels (regional, city and university), organized both at the university and other educational scientific institutions. As a result of the conferences, collections of scientific works of the teachers of the chair that participated in these conferences are published. Employees of the department are periodically published in scientific journals of universities of Kyrgyzstan and CIS on the problems studied in the specialty of car service. The upbringing work of the department is an integral part of the qualitative training of specialists. The department has been actively involved in the educational activities of the university for many years, including student self-government, holding mass events timed to significant dates, patriotic education, spiritual and moral education, and aesthetic education. All teachers of the department are attached to the student groups of the faculty, they carry out a large amount of work on the formation of the world outlook of the transport profession. Information about the availability of equipped classrooms, facilities for conducting lecture and practical classes. 3/209 Department “Transport logistics and service technology”. 3/217 Laboratory “Transport logistics and service technology”. 3/118 Laboratory “Maintenance of Automatic Telephone Exchange”. 3 / 118А Laboratory “Automobile operational materials”. 3/119 Lecture aud. «Electrical equipment of cars». 3/008 Lecture aud. “Examination of road accidents”. Scientific and methodological foundations of the formation of the normative indicators of the operation of automatic telephone exchanges in long-distance traffic. 2.Development of scientific and practical recommendations on optimization of logistics centers and improvement of transport tourism. Teaching disciplines: Transport Economics, Transport Marketing, Transport Management, Transport Logistics. Information technologies in transport. Kariev_1970@mail.ru tel . : 0778020844, 0552414002. AbdurakhmanovSaitbekKozhomberdievichcandidate of technical sciences, docent. Teaching disciplines: Transport energy. PIUP. Construction machinery and equipment. Technics of transport, maintenance and repair. Exploitational properties of transport. Customs on AT. Atamkulov Ulan Toktogazievich Candidate of technical sciences, docent of OshTU. Scientific and methodical works: 20. Aut75@mail.ru tel . : 0772750808, 0703359157. Orozbaev Murat Tolonovich– Senior teacher. of an accident. TBC. ETS. muratot@mail.ru tel . : 0555043687, 0700442020. Duulatosh1234@mail.ru tel . : 0550220393, 0706662324. 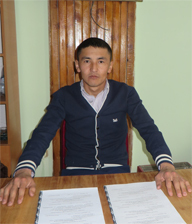 Ergesh uul Bekbolot – engineer of the department, master student. 723503, Kyrgyz Republic, Osh city, Isanov Street 81.